What if recovery has nothing to do with stopping a behavior, or even getting ourselves back to a previous state? True recovery is the process of recovering all of us, and with that, all of the possibilities for ourselves and our lives. Most of us have greatly limited what we have decided we are and can be, particularly after certain events like divorce, death of a loved one or active addictions in ourselves or others. True recovery allows us to see the greatness of us that has been hidden – perhaps for our whole lives. Would you be willing to discover a YOU that’s beyond anything you’ve ever imagined? "YOU are a gift – you have a place in the world and you deserve all the joy and happiness that’s possible." 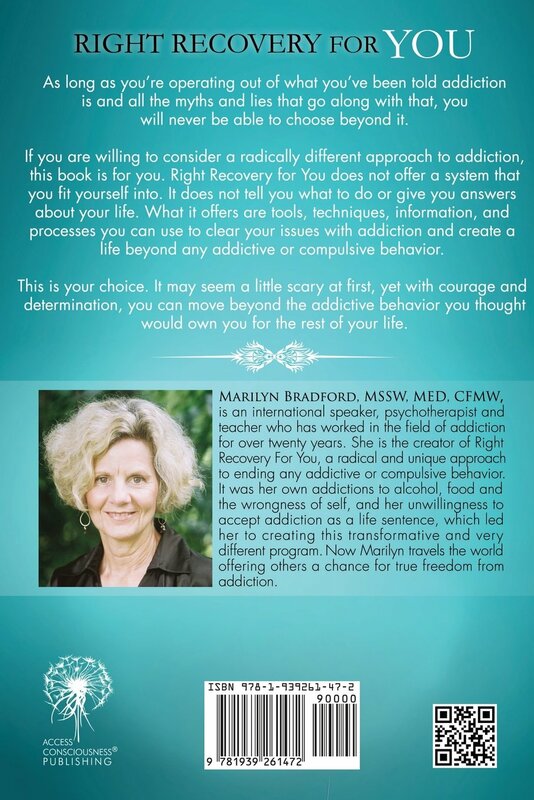 Marilyn Bradford, MSSW, MEd, CFMW, is a dynamic international speaker, licenced clinical social worker, psychotherapist and teacher, and creator of the Right Recovery For You Program. After many years of seeking something very different, beyond the conventional systems of this reality, Marilyn began empowering herself and her clients with the pragmatic tools, techniques and processes of Access Consciousness - taking the brilliance that has been used to create drama and trauma - the limitations, addictions, obsessive compulsive behaviours, poverty, disease… and instead applying it to possibilities; to create a generative and prosperous life and living from awareness and choice. As long as you're operating out of what you've been told addiction is -and all the myths and lies that go along with that- you will never be able to choose beyond it. 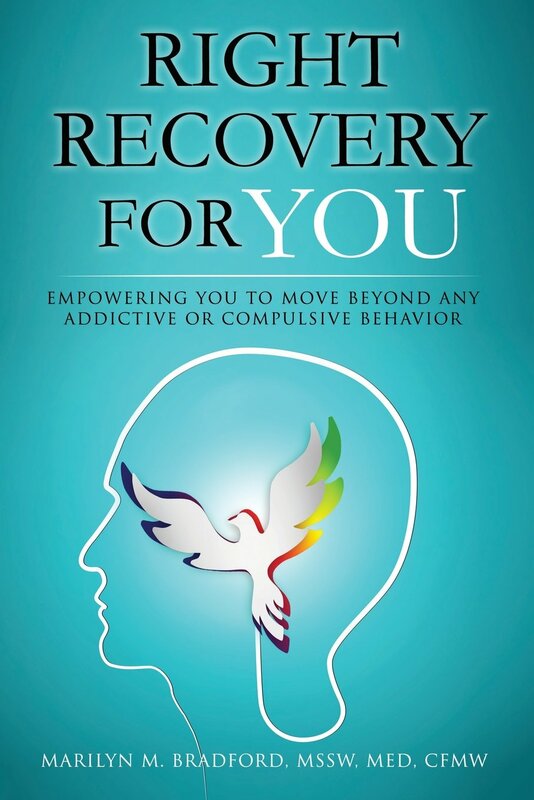 If you are willing to consider a radically different approach to addiction, this book is for you. Right Recovery for You does not offer a system that you fit yourself into. It does not tell you what to do or give you answers about your life. What it offers are tools, techniques, information, and processes you can use to clear your issues with addiction and create a life beyond any addictive or compulsive behavior. ​This is your choice. It may seem a little scary at first, yet with courage and determination, you can move beyond the addictive behavior you thought would own you for the rest of your life.